How big is a Cp? Ferrocene is a sandwich complex of two cyclopentadienyl (Cp) units bound to an Fe centre and is probably the most famous organometallic compound containing a Cp ligand. There are a huge variety of organometallic complexes with a range of metal centres and ligands and there is a great deal of interest in their structural, chemical and physical properties. 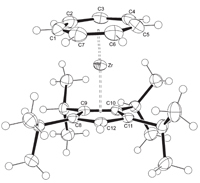 This Hot Article details the preparation of a series of [(η7-C7H7)Zr(η5-L)] (L = Cp and Ind) complexes and their structural characterisation. The authors use this information to develop a system to measure the steric bulk of Cp ligands………..so how big is a Cp? You can also keep up-to-date with the latest news in Dalton Transactions by following us on twitter or signing up to our e-alert service.